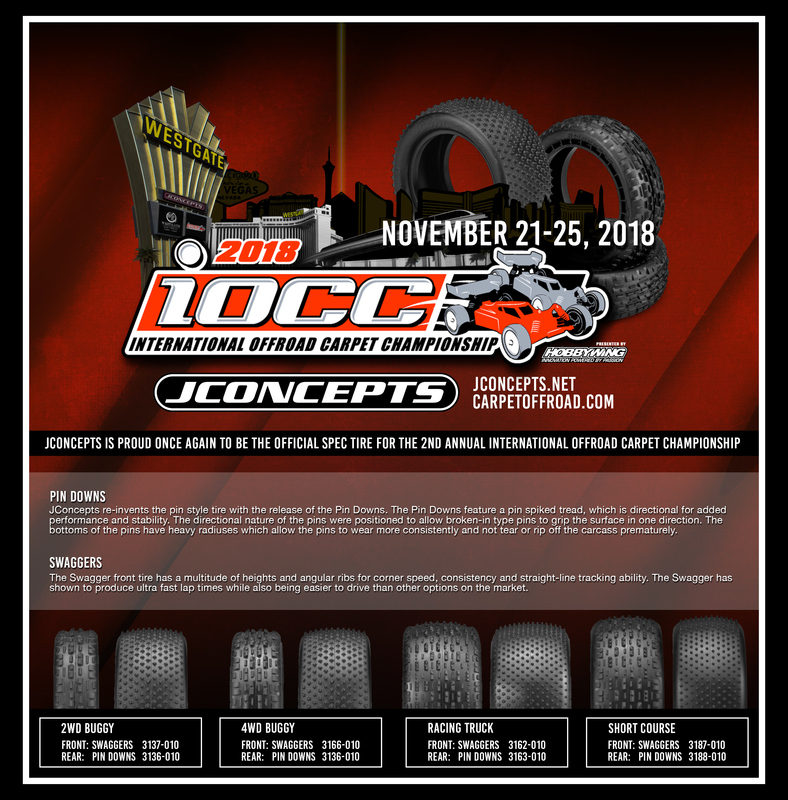 J CONCEPTS WILL AGAIN BE THE OFFICAL SPEC TIRE OF THE IOCC. EACH ENTRY WILL INCLUDE 1 SET OF JCONCPETS TIRES AND INSERTS. RIMS ARE NOT INCLUDED AND YOU MUST PROVIDE YOUR OWN. Racers can get 3 additional sets of tires for qualifying and mains for a total of 4 teched sets for the event. *** this may change depending on total number of entries and number of mains we run. Racers will be notified before qualifying starts on the number of sets allowed for the event. ALL TIRES USED IN QUALIFYING AND MAINS MUST BE PURCHASED FROM REGISTRATION AT THE IOCC. YOU ARE NOT ALLOWED TO USE YOUR OWN TIRES YOU BROUGHT TO THE EVENT FOR QUALIFYING AND MAINS. ON THE SLIM FRONT 2WD RIMS THERE IS NO CUTTING OF THE INNER OR OUTER SIDEWALL RIB TO MODIFIY THE MOUNTING OF THE TIRE TO CHANGE THE PROFILE OR SHAPE OF THE TIRE. REAR TIRES MAY BE MOUNTED IN EITHER DIRECTION. TIRES PINS AND LUGS MAY BE CUT IF DESIRED. TIRE SIDEWALLS MAY BE GLUED. PRO MOD- OPEN TIRE * ANY BRAND MAY BE USED* NO LIMIT TO AMOUNT OF TIRES USED. All motors must be on the approved IOCC List.